Our Very Special Guest Today is Marky Ramone the drummer for the legendary punk rock band the Ramones. Marky Ramone is best known for the 15 years he spent drumming for the Ramones. Prior to joining the Ramones, Marky played with an array of influential musicians dating back to his high school years when he was a member of the Brooklyn based hard rock band, Dust. Recording two albums with his friends, Richie Wise (guitar and vocals) and Kenny Aaronson (bass) for Neil Bogart’s Karma Sutra/Buddha label. In 1976, Marky was introduced to Richard Hell. Along with Bob Quine and Ivan Julian, they formed Richard Hell & the Voidoids. The Voidoids released their groundbreaking debut album in 1977 on Sire Records, entitled “Blank Generation”. Shortly after the Voidoids historic U.K. tour with The Clash, Marky found himself at the bar at CBGB with Dee Dee Ramone. Dee Dee asked him if he would be interested in joining The Ramones. The spring of 1978, Marky joined the Ramones. In a matter of weeks he was in the studio recording his first album with The Ramones entitled, “Road to Ruin”, which features one of the biggest Ramones songs “I Wanna Be Sedated”. The following year the Ramones filmed the cult classic “Rock 'n' Roll High School”. Later that year, they joined forces with producer legend, Phil Spector to record “End Of The Century”. After several tours and two more studio albums, Marky was asked to leave the band in 1983, only to rejoin his band mates in 1987 until they decided to call it quits in 1996. 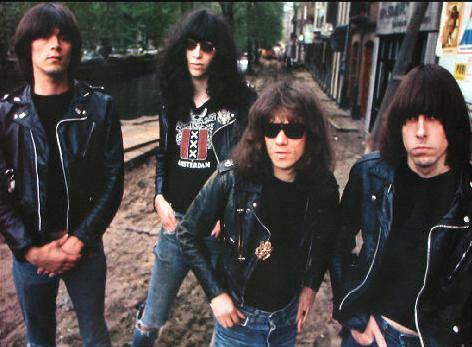 His tenure with the Ramones spanned a total of 15 years. Performing over 1700 shows and more than 15 releases, including songwriting credits on both Mondo Bizarro and Adios Amigos, the bands farewell release. In 2000, Marky reunited with long time friend Joey Ramone for Joey’s solo effort “Don't Worry About Me”. In 2001, Marky along with his former band mates (Johnny, Dee Dee and Tommy), were inducted into the Rock 'N' Roll Hall of Fame. That same year, U2’s Bono presented the Ramones with the MTV’s Lifetime Achievement Award. The DVD release, “Raw”, a compilation of mostly home videos filmed predominantly by Marky was release in 2004 and entered the Billboard video chart at number 5. Certified gold in three countries and currently the best selling Ramones DVD release to date. In February 2010 The Ramones received a Grammy Lifetime Achievement Award. It was the first Grammy for the punk rock pioneers. In early 2010 Marky Ramones Blitzkrieg with Michale Graves released their first single “When We Were Angels” with former member of Sheer Terror, Mark Neuman, playing bass and guitar. 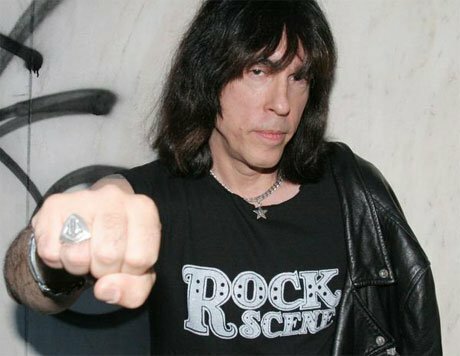 With no signs of slowing down, Marky Ramone continues to tour the world with his band, Marky Ramone’s Blitzkrieg, featuring various lead vocalists including Andrew W.K. and Michale Graves. Marky is currently in his eighth year as a D.J. on SiriusXM Satellite Radio hosting “Marky Ramone’s Punk Rock Blitzkrieg”. 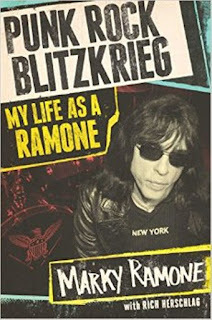 Ramone is also a best-selling author who recently released Punk Rock Blitzkrieg ...My Life As A Ramone – It’s the final word on the genius and mischief of The Ramones told by the man who kept the beat and lived to tell about it. -Available to purchase everywhere including amazon.com and www.markyramone.com. 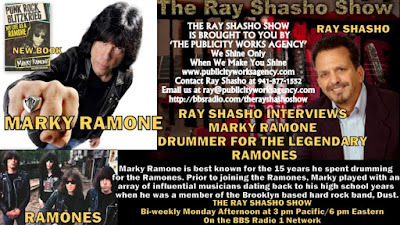 It’s my great pleasure to welcome to the Ray Shasho Show …drummer, songwriter, author and radio host … Marky Ramone.